This item cannot be canceled. *Poster has been posted on Web site of GREENMAX. *Product Information has been posted on Web site of GREENMAX. --- Toll-seat designated vehicles Q Series Tokyu Series 6020 with built-in seats! -The Tokyu Series 6020 is a new model introduced for Oimachi Line express trains, and is manufactured with the same specifications as the 2020 series for the Denentoshi Line and the vehicle exterior, construction in the car, and basic performance. 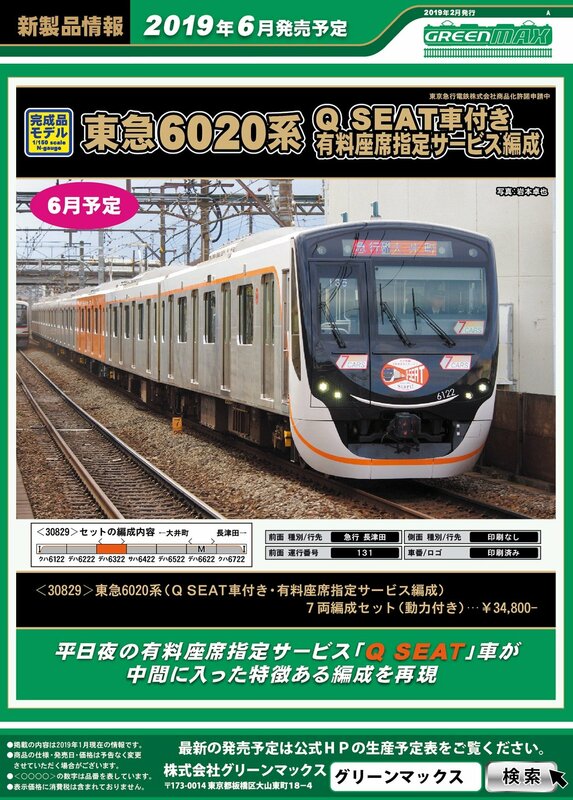 -From December 14, 2018, as a paid seat specification service [QSEAT] to respond to seating needs when returning home on weekdays, replace one intermediate car with a vehicle that can convert a long seat to a cross seat, and from Ooicho Operation started as express Nagatsuda bound for Denentoshi Line. -Commercialize the organization incorporating the [Q SEAT] car that reproduces the cross seat in the car and the long seat with headrest at the car end! -Front direction curtain (full color LED specification) has been printed with [Express · Nagatsuta] and lit in white! ※ Specifications of product may be different from real vehicle.